A pig is my favorite farm animal. All baby animals are cute, though. My little man would absolutely adore this. I hope we win! I'll share the contest on my blog when I get a chance. Just heard my little guy fussing, so i have to run. Thanks!! My favorite farm animal is the chicken. Looks like a great book. Thanks for offering the giveaway. I also follow you through Google Reader! i sub via rss, too. No doubt about it. A cow. Oh, this looks super cute! My littlest guy loves animals!! My favorite is the pig. Lambs are my favorite farm animal. I definitely have to go with a horse! Favorite farm animal would be a horse. 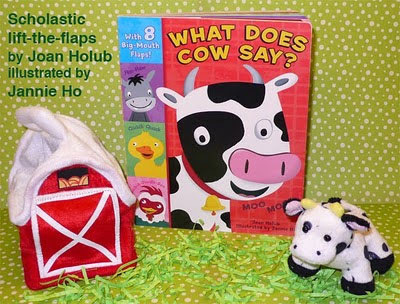 WE love this story's with animal sounds, the cow is our favorite. I love piglets! They are super cute I just wanna geab em and hold em. 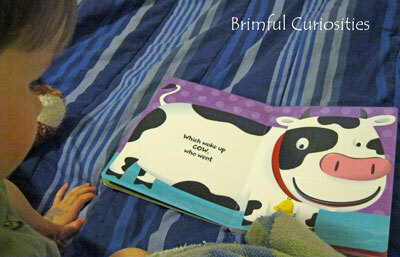 My daughter just loves ponies, cows and reading! My favorite animal is a horse. I would love to win this for my Granddaughter. My favorite farm animal is a lamb. I thought her name was familiar, I know the Goddess Girl series. My favorite animal around the barnyard is the chicken. Thanks for the chance to win! My favorite farm animal is a horse. Growing up in Kentucky, you have to appreciate the beauty of the horse. My favorite farm animal is a goat! I especially love the baby goats! I follow you and am an email subscriber! Our farm cats are my favorite... more like farm children who love to play and always find my lap when I sit down for a rest. But, I also adore our chickens who keep our yard bug-free and deliever beautiful eggs. Thanks for the chance to win this cute set, I'd love to gift to my granddaughter. My granddaughter loves reading to books to us as she learns more about animals through reading. She especially loves the pig pages! We love the horses! We have a ranch full of them! The only song that would soothe my son Will when he was an infant was "Old MacDonald Had a Farm!" He just turned 3 in June and we spent his birthday touring several friends farm animals. We especially loved the big steer, Rocco, and collecting eggs from the chickens. Will loves to tell us stories at dinner time and his most recent story was about how he was going to "ride a cow and jump over a fence and through a pumpkin patch!" He would probably love this book as much as I love your blog. Thank you for sharing! My 1 year old loves all animals, but she has a favorite squeaky pig toy that she especially likes...so I would say we love pigs! We also love books...so this would be super to win! Thanks for the chance. I like the chicken. Thanks. My favorite barn animal are chickens. My son would love this and his favorite farm animal is a pig. The horse is my favorite farm animal. Our favorite farm animal is a horse. My favorite is the horses. How adorable! We have a little girl due any day now, and this would be perfect for her. My favorite farm animal growing up was the cow, so it would make it even more special. Thank you for the lovely giveaway. My favorite is the goat - personality plus! I love chickens. They have so much personality. I follow you on Twitter; https://twitter.com/#!/AsTheNight/status/88083245887012865. I like little lambs. They just look so cuddly. My favorite farm animal are probably horses or pigs! The goat is my favorite farm animal.